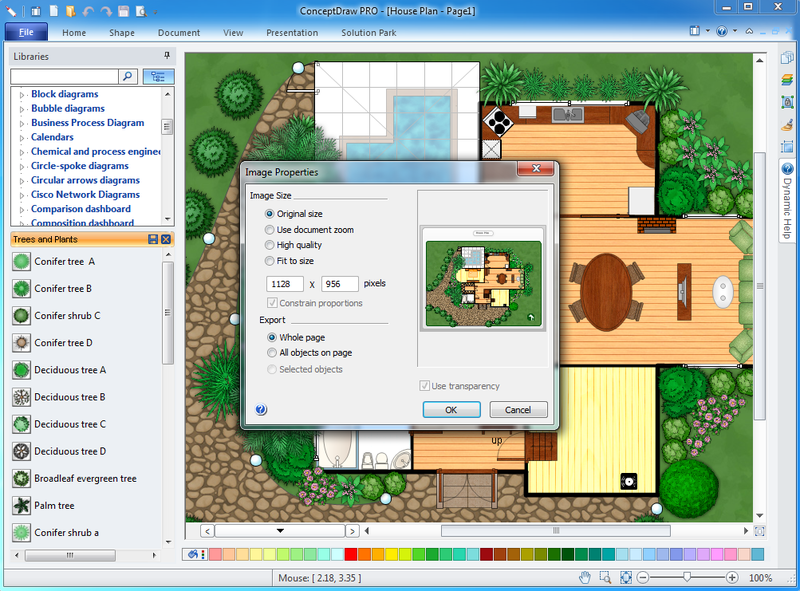 Landscape Design Software for Mac & PC | Garden Design Software for Mac & PC | Free Download! The concept landscape architecture includes landscape planning, design and creation, as well as the management of resources and buildings. With reference to smaller scale projects the design stage and planning are referred to as landscape design. Accordingly, for owners of private houses the time scales and size of projects are smaller, and the section for such projects is referred to as garden design. The specific design documentation is created independently from the scale of project, and at this stage the irreplaceable assistant for you is ConceptDraw. The marked drawing of a lay-out on which is shown how the building elements will be added to an already existing structure. On this drawing all existing lines of supply such as water and gas pipelines, as well as electricity and telephone lines must be marked out. The planting drawing and development plan. On the planting plan is shown how the planted area will be laid out and how it will fit in with the other elements of the plan. 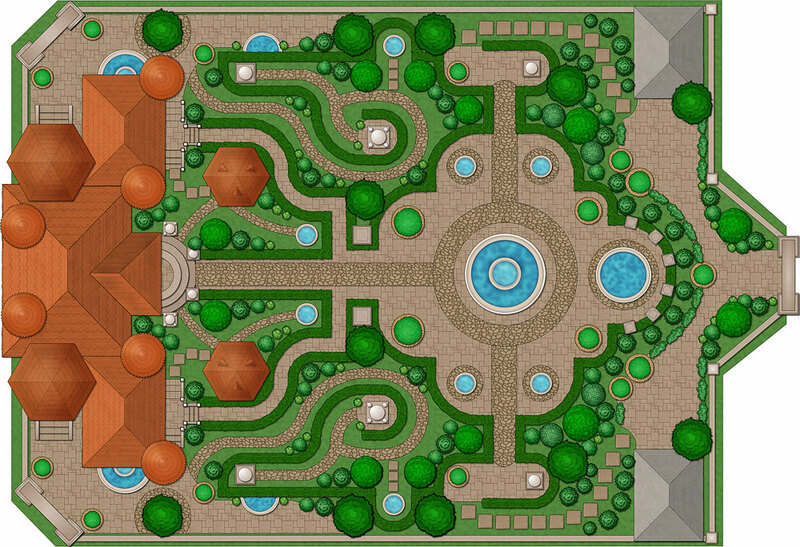 On this landscape development plan the fixed arrangement of specific plants is shown. 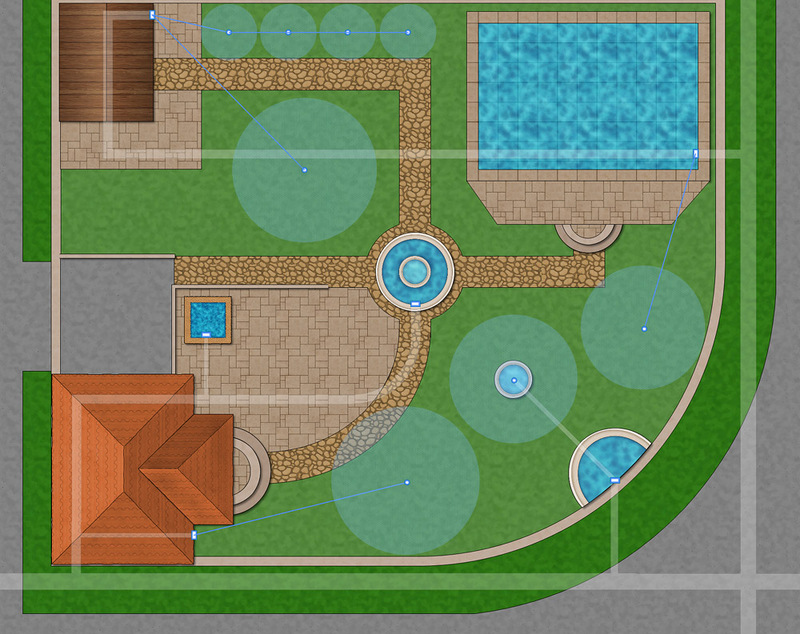 Drawings and plans can all be created using ConceptDraw library objects such as trees, bushes, ponds, fountains, plots, fences, garden accessories, furniture, roofs, patios, flowers, grass, plumbing, roads, junctions, entertainment, walls, windows, doors, etc. By using multilayered pages, all your work can be collected together on one ConceptDraw document. As well as this, by using layers on one drawing it is possible to show the levels of the location dynamically, the plan of the location with lines of supply, and also the plan with and without buildings. To create a ConceptDraw drawing you first have to open a template from a gallery and then all the libraries needed for your work will open automatically. After opening a template you can set its parameters, such as unit of measurement, scale and page size. Then simply drag the objects you need from the library to the document page, set the sizes and arrange them how you want. The convenience of ConceptDraw is that although you can only place available library objects on the page of the document, you can always create an object and add it to your own library for later use. Objects in ConceptDraw can be connected to each other or to a group. For example, if you show a water pipe in the form of a connection between two final points, when moving these points it will automatically be extended or shortened. 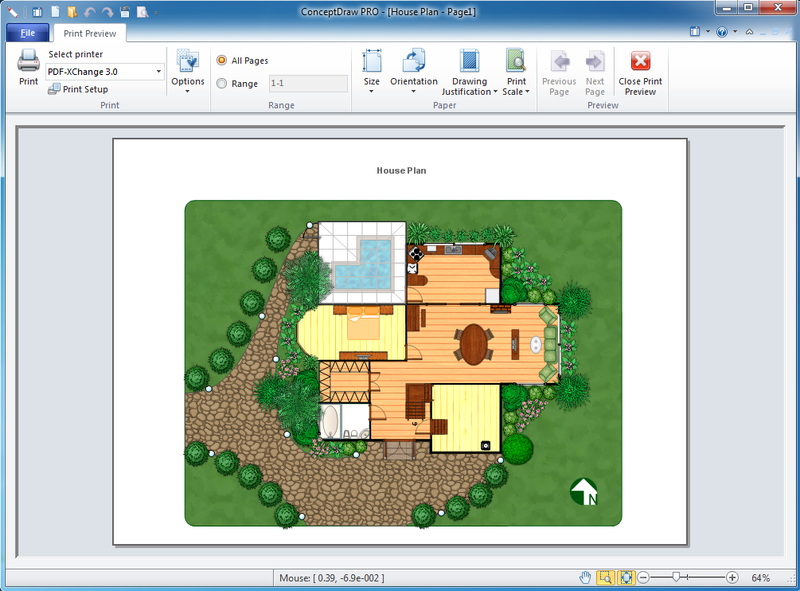 As the plan created using ConceptDraw is not a static document, it can be used not only in the work of landscape architects and engineers, but also by landscape managers who maintain artificial landscapes such as parks and gardens, or natural landscapes like woodlands or nature reserves. 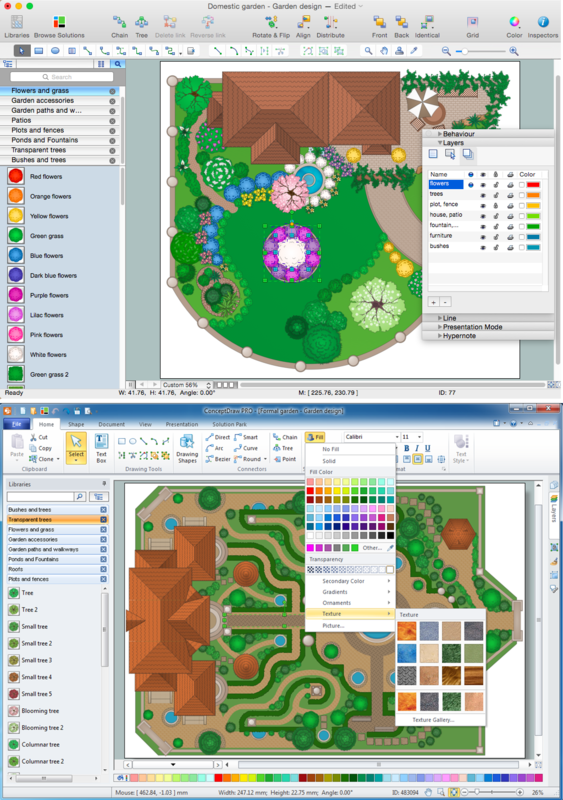 The landscape manager or engineer can easily transfer ConceptDraw objects of landscape design directly to a document in order to view the end result, as well as use ConceptDraw smart objects to understand their physical influence on the environment. For example, how the shadow from an object will change depending on the position of the sun, how the finished work will look when viewed from a different angle such as the window of a building, what changes the addition of new objects to an existing landscape will make, or even how much a tree will bend in a strong wind. MS PowerPoint for presentations, and many more. 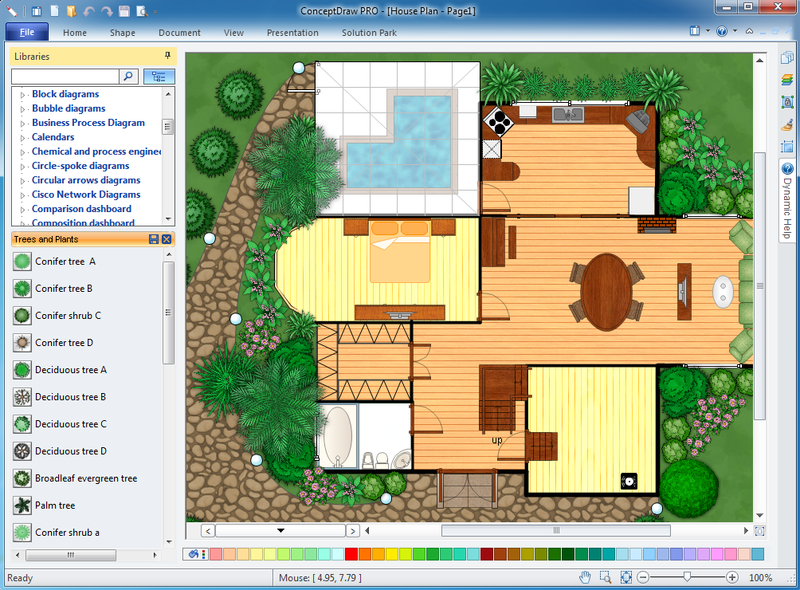 The Landscape & Garden solution for ConceptDraw DIAGRAM includes a wide collection of templates and samples to help you draw any landscape-related diagrams and schemas as quickly as possible. This solution contains four libraries which are very useful for creating such plans. The Parking and Roads library contains elements for comfortable parking projection: ramps, driveway, intersections, parking lines and parking stalls. The Site Accessories library contains useful elements with various urban objects: benches, lamp posts, site lights, drains, gates etc. You can add elements from this library to a parking plan or a street plan. The Trees and Plants library contains various shapes of trees, tree crowns, evergreen shrubs, hedges, grass, etc. The Vehicles 2D library contains vector shapes of cars, trucks, pickups, buses and vans. This library is useful for lane planning, parking plans, etc. You can color them with any shade you like. It is worth mentioning that all these elements are stretchable, and you can customize them in every way you want.